Cornelius Castoriadis is presently Director of Studies at the Ecole des Hautes Etudes en Sciences Sociales in Paris. He is a philosopher, social critic, professional economist, practicing psychoanalyst and one of Europe's foremost thinkers. 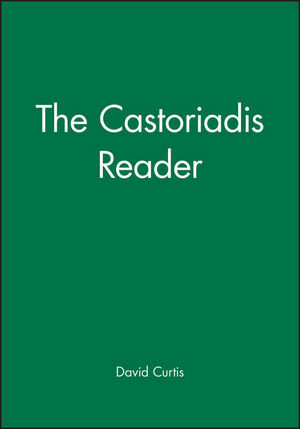 The Castoriadis Reader provides for the first time an overview of the author's work and encompasses every aspect of his thought. David Ames Curtis is an independent translator and writer. He is based in Paris. 1. 'The Only Way to Find out If You Can Swim Is to Get into the Water.' An Introductiory Interview (1974). 2. Presentation of Socialisme ou Barbarie An Organ of Critique and Revolutionary Orienation (1949). 3. On the Content of Bureaucracy to the Idea of the Proletariat's Autonomy (1955). On the Content of Socialism, II (1957). 4. Recommencing the Revolution (1964). 5. Marxism and Revolutionary Theory (1964-65). Excerpts. Marxism: A Provisional Assessment. Theory and Revolutionary Project. 6. The Social Imaginary and the Institution (1975). Excerpt. The Social-Historical. 7. The Social Regime in Russia (1978). 8. From Ecology to Autonomy (1980). 9. The Crisis of Western Societies (1982). 10. The Greek Polis and the Creation of Democracy (1983). 11. The Logic of Magmas and the Question of Autonomy (1983). 12. Radical Imagination and the Social Instituting Imaginary (1994). 13. Culture in a Democratic Society (1994). 14. Psychoanalysis and Philosophy (1996). 15. Done and To Be Done (1989). * This volume provides the first general overview of the Castoriadis's work - ranging across earlier works to conclude with Castoriadis's most recent writings. * Also presents hard-to-find texts previously only available in small specialist journals. * Serves to provide an historical overview of the evolution of the author's views -- texts have been organised in chronological order. * A final chapter features Castoriadis's responses to the critics and contains the author's forceful and thoughtful replies to 30 discussions of his life's work which were written by an international collection of scholars.